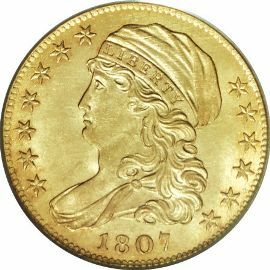 The Capped Bust Half Eagle (Head to left version) was coined between 1807 and 1812. This is a new design created by John Reich, a German engraver who sold himself as an indentured servant in order to come to America. In 1807 John Reich became assistant engraver for the yearly salary of $600.00. The obverse of this five dollar gold coin features a portrait of Liberty wearing a soft cap inscribed with "LIBERTY". Surrounding the portrait are thirteen stars with seven on the left and six on the right along with the date beneath. 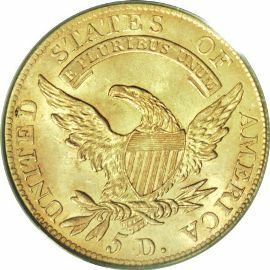 The reverse of these rare gold coins bears an eagle with wings spread and a ribbon between them. On the ribbon the motto "E PLURIBUS UNUM" is inscribed. Also encircling the entire design is the inscription "UNITED STATES OF AMERICA" and the denomination "5D".